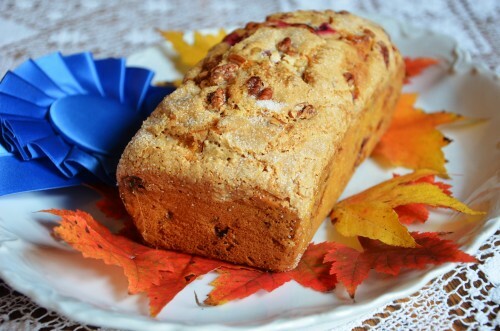 A few years ago I made this recipe with craisins and pecans and it won second place at the Great Smoky Mountains Blue Ribbon Country Fair. This year I added white chocolate and instead of using craisins, I used fresh cranberries. It won first place. For about 6 weeks, mid November through Christmas, you can buy them fresh in the store. I like to use them year around so when they go on sale after Christmas I purchase around 30 bags a year and freeze them in a ziplock baggy. When you make this recipe they are the last thing to go in the batter. I just dump them in frozen. The batter will be stiff but you can mix them in. The loaf pans take a little longer to bake than a loaf with craisins but I like this recipe so much more! Enjoy. Add egg and beat until fluffy, then add orange juice and beat briefly. Add baking powder, soda, salt and mix briefly, then add your flour and beat until combined. Mix in orange zest by hand (otherwise it gets tangled around the beaters) along with the white chocolate pieces and pecans. Grease and flour two 3 ½” X 7 ½” bread pans. Cut and put wax paper on bottom. After placing the batter into the bread pan, sprinkle about a teaspoon of sugar on top of the batter to crisp the top while baking. Bake at 350 for 65 to 85 minutes if the fresh cranberries are frozen. Test with toothpick at about the 1 hour mark, every oven is different. Let cool for 20 minutes before flipping out of the pan and peeling off the wax paper. The bread cuts better if it has cooled down completely and the bread freezes beautifully.